Please make sure you have installed and activated Divi Theme or Extra Theme or Divi page builder plugin. 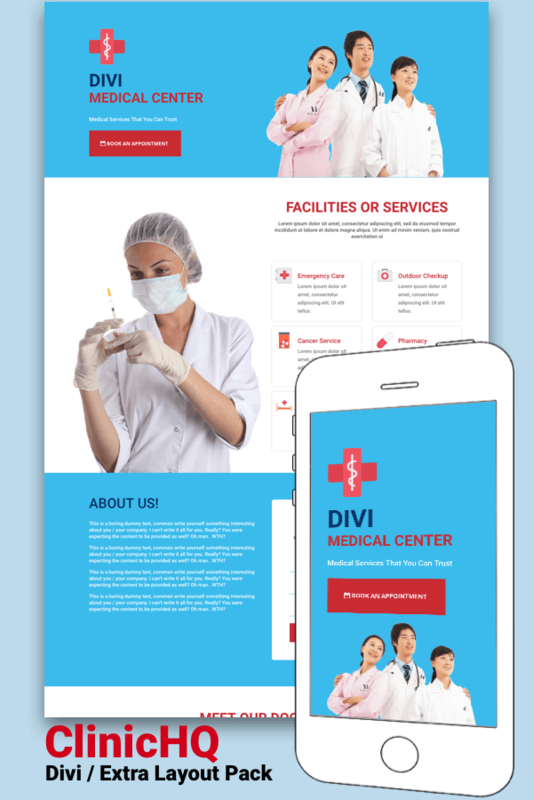 Upon purchasing this layout pack, you will receive a zip file containing one .json file named “ClinicHQ-Divi-Layout-Pack.json” file which you can upload to your Divi Library to import which will import all the page layouts into your divi library. In the zip provided you will also see a file named “custom.css” file which contains some custom css codes, please open this file in any text editor and copy all the code from there and paste it in your Divi > Theme Options screen in the “Custom CSS” box at the very end on that page. Now you may create your new pages and than load the templates from your Divi library. Icons: Used flaticon pack http://www.flaticon.com/packs/medical-29 you may use these icons but will have to credit them, please read more on the link. I have a subscription to Elegant themes. Can I get the homepage for this for free? We are an independent company so I am afraid not.